How is your prayer life? In this booklet, Spurgeon treats the subject of ordering our cause before God, filling our mouths with arguments, and praise and thanksgiving. 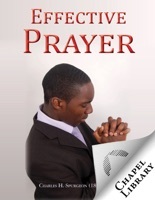 Spurgeon claimed that the secret to his success was the prayers of his people. We need more men and women of prayer in our day! Adapted for today's reader with punctuation, minor word order changes, headings, and substitution of modern pronouns for thee, thou, thy, and thine.